As you already know, I like re-creating meals from restaurants or eatery places that I have visited and loved. It is fun to brain storming what is in the dishes I like. If you ask me what they do best, I think they probably do great on sauce that goes with dish they serve, along with seafood dishes. If you like to taste best salmon dish from restaurant, I think Bonefish Grill comes top on the list and, 2nd would be Firebirds Wood Fired Grill. When it comes to steak battle, Firebirds Wood Fired Grill wins over Bonefish Grill hands down, but both great restaurants to check out if you have never visited them. Anyway, the Bonefish Grill has interesting side dish on the menu called “Herbed Couscous”. The couscous they use in the dish is pearl Couscous or also known as Israeli couscous. I have eaten regular itty bitty couscous that can cook up in a couple of minutes but I prefer the texture of the Pearl Couscous better. The dish got Pearl Couscous,lemon, olive oil,basil etc.. and, when my husband ordered it, I got to taste test some of their couscous dish and I thought it was tasty. Then,recently, I have tried recreating the Herb couscous that I tasted at the restaurant. In fact, since I liked it a lot, I have made it more than twice already:-) The dish is so simple but full of flavor. My version of the dish has toasted pine nuts while Bonefish one doesn’t,and the restaurant’s dish has more basil flavor but mine taste more lemon with hint of basil. I like the texture the toasted pine nuts can give to the dish and I Prefer the dish with more citrus flavor,rather than strong basil taste as if basil pesto is mixed in the couscous. It came out great and my husband ate it all.Nothing left on his plate:-) He loved it. Therefore,I thought I would share the recipe with you. 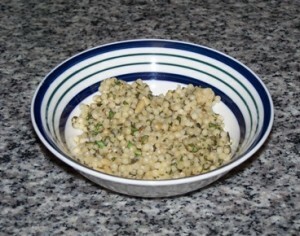 Herbed couscous “Yassy’s version”;Herbed couscous with toasted pine nuts..
3. Add 1 1/4C chicken broth and bring it to boil,and stir and put the lid on. Then, lower the heat to medium low and cook for 10 minutes.